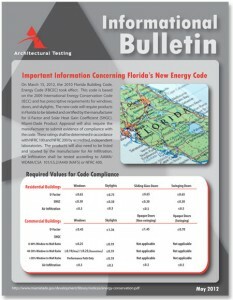 The latest energy code information is now available. This new code requires products such as windows, doors and skylights in Florida to be labeled and certified by the manufacturer for U-Factor and Solar Heat Gain Coefficient (SHGC). The manufacturers will also be required to submit evidence of compliance with the code. Lemon Bay Glass is ready to assist you in your product choices and ensuring they meet the new Florida energy codes. Link here to read the Informational Bulletin. 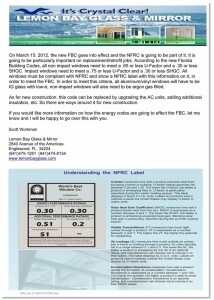 Lemon Bay Glass delivers information on how the energy codes are going to effect the Florida Building Code (FBC). On March 15, 2012, the new FBC went into effect and the NFRC is a part of the new regulations. It is particularly important on replacement/retrofit jobs. Link here to read the LBG announcement. Contact LBG today for specific product information.